William Dawes played an equal (if not greater) role in the famous Midnight Ride to Lexington as Paul Revere. Dawes, however, never had an epic poem written about him and, therefore, is not as well known to history. William Dawes was a Boston tanner who became very upset by the Townshend Acts, which he believed were destroying his city. As a confidant of Samuel Adams, Paul Revere and Dr. Joseph Warren, Dawes became an early member of the Sons of Liberty. In the newspaper announcements regarding his 1768 wedding, William made sure it was known that he wore an American made suite. This was done to promote a boycott of British produced goods. About this time, Dawes joined the Artillery Company of Massachusetts. He became a Sergeant in this Company and helped secure cannons and move them to Concord. William Dawes was one of these men. Actually, Dawes had the same destination as Revere…Lexington. They both intended to warn John Hancock and Sam Adams that the Redcoats were on their way to arrest them. The two riders took separate routes to ensure, in case one of them was captured, that the message would reach Lexington. They both arrived at approximately the same time and Hancock and Adams escaped. Dawes and Revere then continued toward Concord. They were joined by a third man (Samuel Prescott) but ran into a group of British officers who demanded they stop. Dawes, for his part, rode his horse up to a house shouting that the officers had followed him. The officers, thinking they were being led into an ambush, turned and fled…just as William had hoped. His ruse had worked, but he was unable to continue to Concord as moments later he was thrown from his horse. Legend has it that he returned later and was able to find his pocket watch in the yard of that house. After this event, details of Dawes’ life begin to get fuzzy. We know that he became a Major in the Boston militia and that he served time as a Quartermaster. In this role, he oversaw many of the prisoners of war who were taken after the Battle of Saratoga. These prisoners complained that he was not giving them enough rations but he countered with the accusation that they had been stealing from local farmers. This may have been true, but those farmers had problems with theft from Continental Soldiers as well so it is difficult to know exactly who was causing these problems. 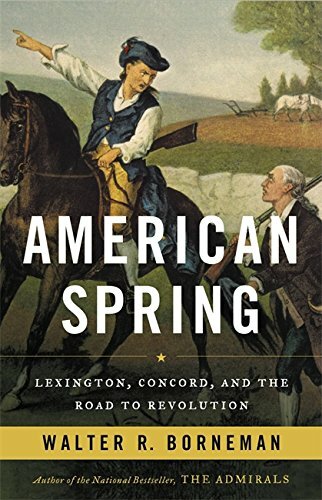 To learn more about William Dawes and the events leading up to Lexington and Concord, give 'American Spring' a read. It is a great look into the tensions in Massachusetts leading to the American Revolution. It should be available at your local library and if not, support this site by grabbing a copy from Amazon through the link below (at no additional cost to you of course). And please subscribe to our email list for a new Founder every day, plus updates regarding this site every once in a while.